BodyMe`s new range of highly digestible and organic vegan protein powder blends. Each contain a unique blend of 3 plant proteins from pea, sprouted brown rice and hemp seeds providing a complete protein with all 9 essential amino acids and more. 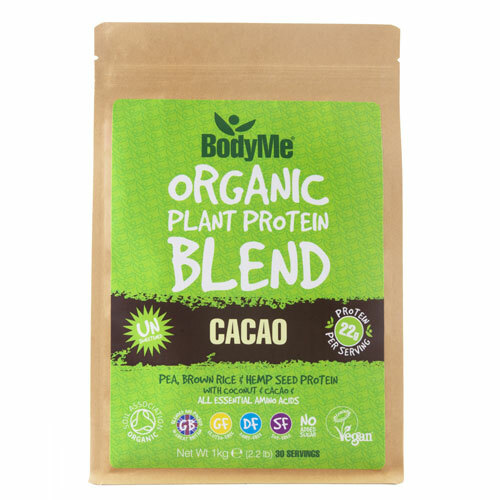 BodyMe keep their cacao vegan protein powder blend unsweetened with a hint of raw cacao and coconut, so is flexible and easily added to smoothies, nut milks, recipes etc... or simply blended with water and a little sweetener / banana for the perfect post workout vegan protein shake or plant based protein boost to a vegan diet. Add 33g (2 flat scoops) to smoothies, juices, shakes, recipes for the perfect vegan protein boost. 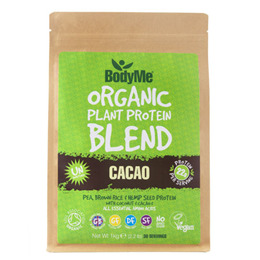 Below are reviews of BodyMe Organic Protein Powder Blend - Raw Cacao - 1kg by bodykind customers. If you have tried this product we'd love to hear what you think so please leave a review.